Jokbal which means pig’s trotters when translated is a popular Korean dish worldwide. 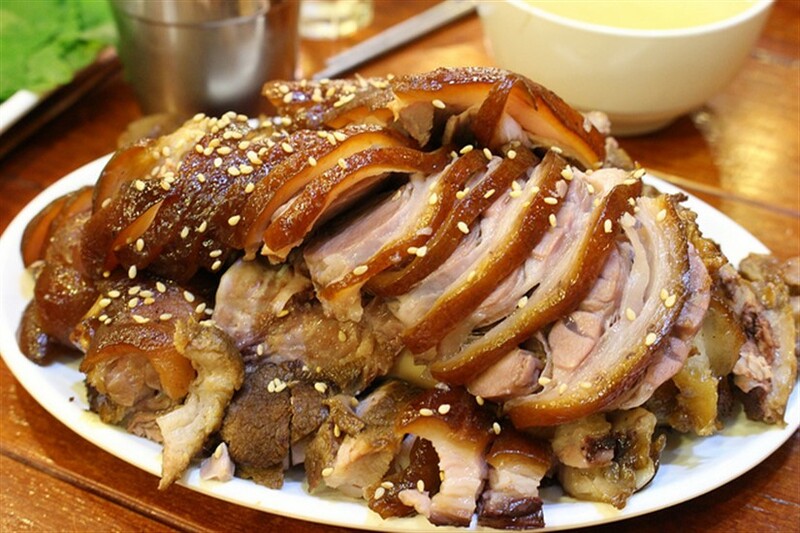 The pork is spiced with soybean sauce, ginger, garlic and other spices ofchoice. It is usually served in a dark broth made from soy, ginger, garlic andrice wine. The broth in which the pork is stewed is made according to different recipes andevery restaurants guard their recipes jealously. Condiments like ssamjang andsalted shrimps are commonly served with the dish to be added by the guest orcustomers. 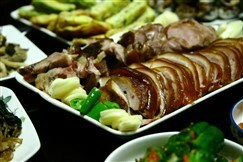 Jokbal is usually served on a large platter to be shared by severaldiners Korean-style. Side dishes that are served with the dish include Kimchi,lettuce and other green vegetables. Jokbal can also be wrapped with lettuce leaves and eaten with other side dishes. It iscommonly eaten as an accompaniment to soju. The natural gelatin in Jokbal is good for the skin and for preventing wrinkles. Jokbal is also considered to be a hangover cure and is also used for detoxification.